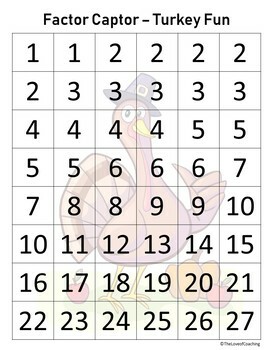 This holiday themed multiplication math activity is designed to build a student’s understanding of multiples and factors. Students will find factor pairs for a whole number and recognize that a whole number is the multiple of each of its factors. Super easy, set up! 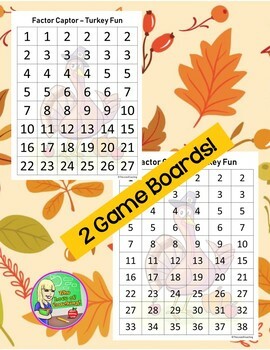 Print, laminate, cut the cards and you are ready to play! Students love playing this fun and interactive math game. It teaches students to be strategic in their choices. Students quickly learn that prime numbers are not a good choice for a multiple. 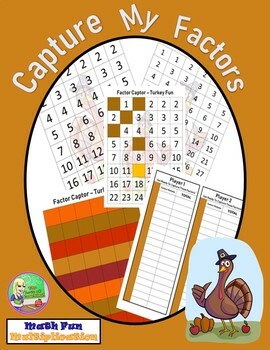 Game includes 2 factor captor game boards, colored cards to use as covers, a recording sheet for scores, directions for the students as well as a teacher’s guide. Ideal for small groups! This game can be played as a guided math center, collaborative station, a task for early finishers or a homeschool math game. Directions: Player 1 chooses a 2-digit number on the game board and covers it with a chip or square, then records the number on the tally sheet. This is Player 1’s score for the round. 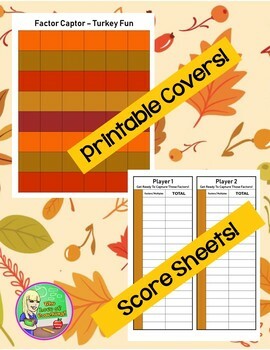 • Player 2 covers all factors of Player 1’s number, then records all the factors on the tally sheet and add them to find the sum. This is Player 2’s score for the round. Apply properties of operations as strategies to multiply. Find all factor pairs for a whole number in the range 1-100. Recognize that a whole number is a multiple of each of its factors. Math games give students the opportunity to explore numeracy in a way that increases retention. Finding factors and multiples is an essential part of any mathematics curriculum. Students need knowledge of factors when solving equations on many types of assessments. This game can support students with solving division problems as well as the simplification of fractions! Thank You For Your Purchase! I appreciate you! Have Fun Capturing Those Factors!